Jaw joint pain is also commonly called "TMD", which stands for Temporo-Mandibular Disorder (or Dysfunction), or sometimes TMJ, which stands for Temporor-Mandibular Joint. A bite guard of some sort is a common treatment method. But first, let's take a look at how your jaw joint might hurt, and what the causes might be. The jaw joint is a REALLY complicated joint. It can move in several directions, and what happens to the joint on one side of your head directly affects the joint on other side of your head, because the joints are splinted together by your lower jaw! Pain in the jaw joint when chewing. Grating sounds, or a clicking noise if you move your jaw, or when yawning. Morning headaches, when you wake up first thing. Pain or maybe a simple tenderness around your jaw. You can't open your mouth as wide as normal. A ringing sound in your ears. (also called tinnitus). A pain in your shoulders and neck. Jaw joint pain sits in a kind of "neutral zone" between medicine and dentistry. There is no official recognized speciality in TMD, and it has been one of the most misunderstood areas of dentistry. There are some doctors and dentists who limit their practice to this disorder, but the background they come from can influence how they look at the possible causes, and therefore the type of treatment they recommend. This was made plain to me when I talked to several specialists in different fields about headaches. The physiotherapist said headaches were commonly caused by tension in the muscles around the neck, and that massage would help. The dietician told me that food allergies caused headaches, and anybody who suffered from regular headaches should keep a record of everything they ate, and then eliminate one food type at a time to see which food it was. The consultant physician told me that disturbances in blood circulation were the cause. The neurologist thought it came down to inflammation of certain nerves, usually an over-active trigeminal nerve. BUT when we focus on jaw-joint pain, there is a LOT of research that clearly points to tooth clenching being a major factor! NOT the ONLY factor - BUT A MAJOR ONE, OFTEN IGNORED BY HEALTH CARE PROFESSIONALS. The most intense tooth-clenching and tooth grinding (we call it "Bruxism") occurs at night, when you are deeply asleep. People with this problem sometimes also have "restless legs" when trying to fall asleep. Clenching or grinding your teeth, especially when you are asleep. This is something that happens REGULARLY, usually every night. Trauma of some description. This is something that happens ONCE, and causes damage. (trauma from an automobile accident, over-opening your jaw when yawning or eating). Joint Degeneration (osteoarthritis, rheumatism, etc). This is something that happens slowly, over time. BUT, one of the causes of degeneration is also overloading of the joint, which can happen during tooth clenching and grinding. Jaw joint pain as a result of night-time tooth clenching depends on how much force is put on the joint, and for how long. Usually people don't know they are grinding their teeth at night, because they are asleep! Clenching your teeth will compress the jaw joint. This can put a lot of stress into the tissues in and around the joint. Also, if you are clenching your teeth off to one side, the jaw joints are loaded unequally, and at an awkward angle. This makes one jaw joint more painful than the other side. Jaw joint pain is common after any kind of single-event trauma where the jaw gets hit, for example in an automobile accident, or a getting punch to the jaw, say during sports activities such as boxing or football. The blow can affect the joint in several ways, depending how forceful it is, and how much the joint is stretched or pulled out of position. The worst is a blow that knocks your bottom jaw sideways. A one-off trauma like this will cause inflammation in the joint, maybe some swelling, and of course pain. You probably can't open your mouth as wide as normal. The joint can also be stressed by over-opening, eg. yawning widely, or stretching wide open to eat something! It can also happen if you have had a long appointment for root canal or wisdom tooth removal. Sometimes your dentist can give you a small rubber bite block during longer appointments, to rest your teeth on. This lets the muscles around your jaw relax, and reduces the strain on the jaw joint. You can only decide on the best treatment after you have worked out the most likely cause of the pain. This might seem obvious, but I'm surprised at the number of times a dentist will recommend his favorite "treatment" without really exploring the causes of a patient's pain. I have seen cases where a tooth was extracted or a root canal started because the dentist didn't realize that the pain was coming from the jaw joint, not the teeth! OR that a tooth was aching and sensitive BECAUSE of night-time clenching (bruxism); All he had to do was treat the clenching, NOT the tooth! Bite guard. Worn at night only, I believe this is the best treatment for most cases of jaw joint pain. But there are TWO basic designs. 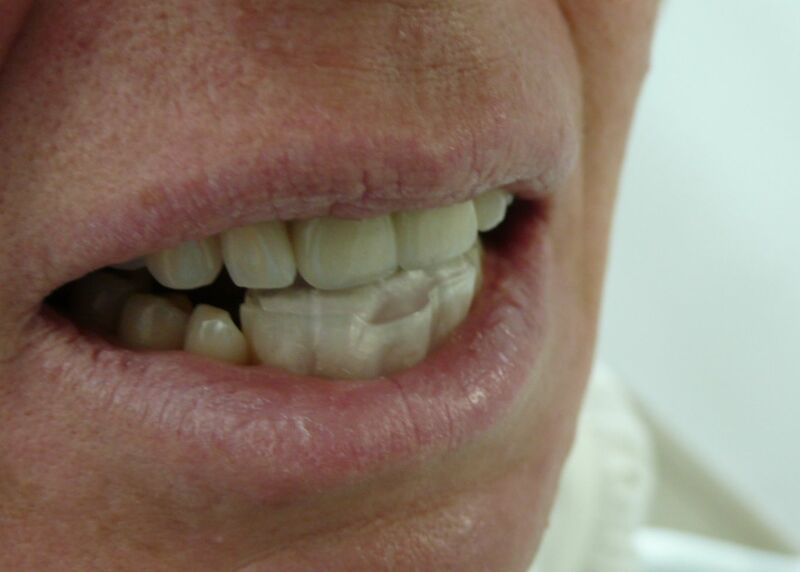 One is called a FULL ARCH splint, because it covers ALL the teeth in one jaw, (usually the lower teeth). The other type is much smaller, and only covers the four incisors at the front. Again, it's usually on the bottom jaw. I think that the smaller design is better. I recommend the NTI design of bite guard. You can find an NTI provider here. Exercises. These can be most useful for MILD cases of jaw joint discomfort, where there has NOT been an obvious one-off trauma. Sit upright in a chair, and make sure you are comfortable. You don't have to sit BOLT upright, but it's better if you are NOT slouching! 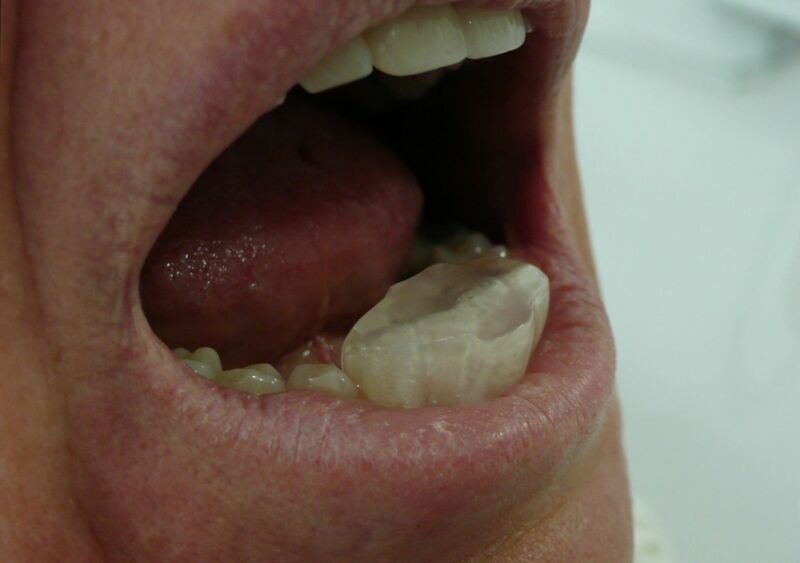 Take the tip of your tongue, and gently place it on the inside surface of the last molar on your bottom left-side jaw. Now slowly run it around the inner surfaces of the bottom teeth, from left to right. When you get to the last tooth on the bottom right, move the tip of your tongue over onto the OUTSIDE of that tooth. Now slowly run your tongue from the right side, over the OUTER surfaces of your bottom teeth, to the left. All the way to the last tooth on the left side. Now bring the tip of your tongue back onto the inner surface of the last molar on the bottom left, and repeat the movement once more. Now reverse the direction. Start with the tip of your tongue on the OUTSIDE of the last tooth on your bottom left jaw, and slowly run it around the outer surfaces of the bottom teeth, over to the last tooth on the right, then move the tip of your tongue to the inner surface, and move it slowly over the inner surfaces from right to left. Do this twice. Now repeat the whole procedure for the upper teeth. Do these excercises very slowly and gently. Don't "force" anything. The movements will give your jaw joints a yoga-style stretching session! Anti-inflammatory drugs. Taking anti-inflammatory drugs such as ibuprofen or diclofenac can help to reduce pain and swelling for jaw joint pain caused by a one-off trauma. The other obvious causes of jaw joint pain are dislocation of the joint, where your mouth is stuck open, and a fractured jaw joint. In both cases, you should go to the Emergency Room of your nearest medical facility. After initial treatment for the dislocation or fracture, you will be advised to rest the joint as much as possible!